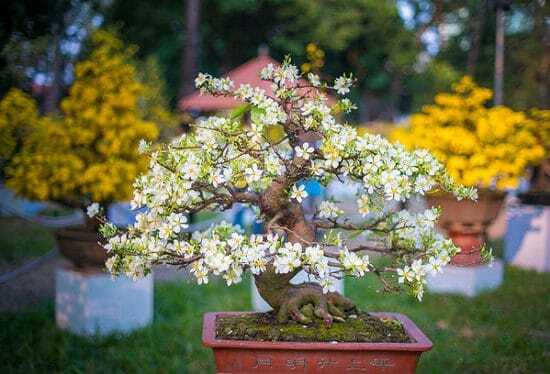 If you’re a beginner, these Bonsai Tree Care Tips will educate you about the most basic aspects like choosing the right soil, fertilizer, pot, watering, etc. How to Care for Bonsai? 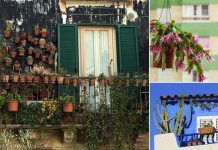 Should you keep them outdoors or indoors? Can you use a regular potting soil for growing a bonsai tree? What is the best fertilizer for bonsai and how frequently you need to water? Learn everything in detail in this article. The ideal location for growing Bonsai depends on several factors such as climate, species of tree and time of the year. By thumb rule, the outdoor varieties should be given at least 6 hours of sun exposure daily and protection from cold winds. Indoor trees do equally well in direct sunlight location, so placing them on a South-facing window is a good idea. Ensure even temperature and humidity for indoor Bonsai. The right Bonsai soil mix should be nutritionally rich and well-drained to prevent root rot while holding enough water to meet the tree’s needs. Ideally, Bonsai gardeners swear by a mixture of lava rock, pumice, and Akadama in a 1:1:2 ratio. 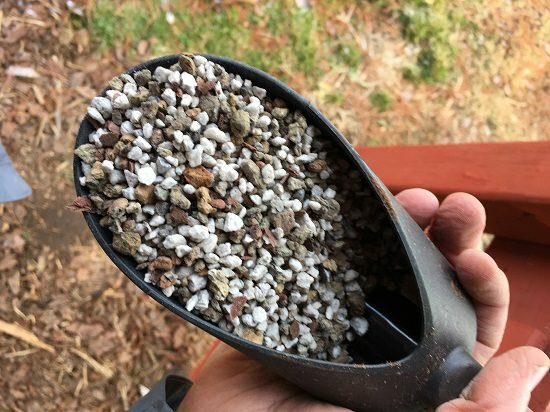 When you want to improve drainage of your mix for a wet climate, increase the proportion of lava rock, and if you want to increase water retention during dry climate, use more Akadama. Most of the soil mixes you’ll come across are labeled as organic or inorganic. Organic soil is rich in plant matter like leaf and bark. It is rich in nutrients, but it breaks down easily, reducing drainage and causing long-term problems. However, inorganic soil has components like lava and clay that drain faster and maintain good aeration. However, they offer a poor complement of nutrients. Determining whether you’re dealing with a male or female Bonsai is the first step of choosing a pot. Masculine bonsai trees are mature with thick bark, dense branches, and sturdy trunks. Feminine ones have a cascading or graceful structure with smooth bark and light colored branches. Masculine pots are square, oblong or rectangular with sharp edges. They have intricate carvings and are often covered by a lip on the rim. More often than not, they’re elevated and filled with rocks. Feminine pots, on the other hand, are oval, or cylindrical, with a smooth texture and flat edges. They often showcase symbols and lack elevation. 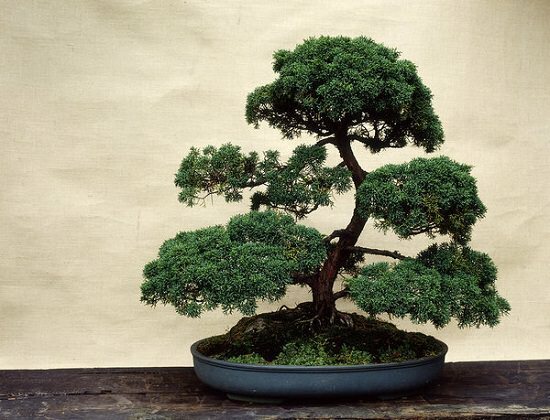 When it comes to size, the thumb rule is that if the Bonsai’s height is more than its width, the container length should be at least two-thirds of the tree’s height. However, if the width is more than the height, the container length should be two-thirds or more than the tree’s width. Also, if the tree is masculine and has dense foliage, consider a wider pot with little elevation. Flowering and fruiting bonsai have rapidly growing roots thus should be grown in deeper pots. Watering is the most critical component of a Bonsai tree care regimen. How often you water depends on several factors such as size and species of the tree, size of the pot, season and soil mix. In other words, it’s practically impossible to lay down ground rules for watering Bonsai. However, never let the growing medium to dry out completely because of the constricted root system of these plants. Stick your fingers in the soil around one or two centimeters deep. If the soil feels dry all the way to that depth, you know it’s time to water. Don’t wait till it’s completely dry though. If the surface appears hard on hot afternoons, consider submerging the pot in water for 10-15 minutes. That should restore the lost moisture. When the soil looks light brown and barely wet, pour water all over the surface till it drains out the pot through the holes beneath. Remember, bonsai trees have constricted root systems that need a constant supply of water. Also, the hotter the weather or the location, the more water they’ll use. As long as you keep checking the soil now and then, and allow the soil to get barely damp in-between waterings, you’re fine. Solution: Allow your mildly dehydrated Bonsai to sit in water for a few minutes. It will re-bud in one month or so. Do not be tempted to over-water during this time. Mist new buds to encourage growth. Solution: Repotting an over-watered bonsai is the only option. 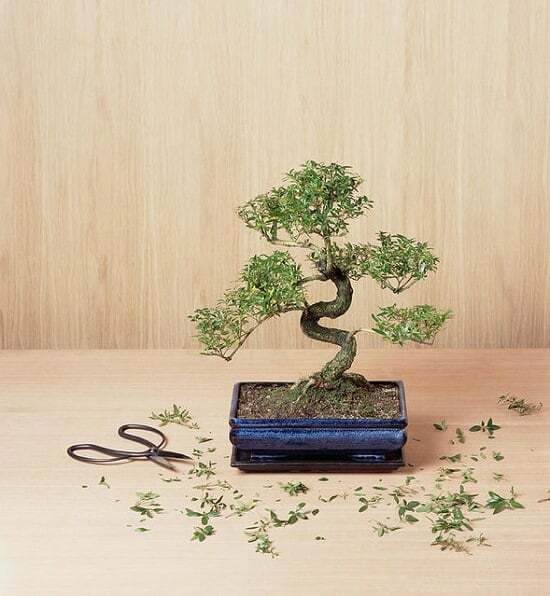 Using sharp shears, remove dead, damaged parts of the bonsai. Ensure the cambiums on the remaining parts are green and healthy. Gently lift the bonsai from its old container, shake off the loose soil and repot it. The soil mixture determines how often bonsai needs watering. Mostly, a mixture of lava rock, pumice, and gravel work fine. Using a mixture with water-retentive components such as compost or Akadama is good for those who are too busy to water regularly. There are two expert-recommended ways to watering Bonsai. 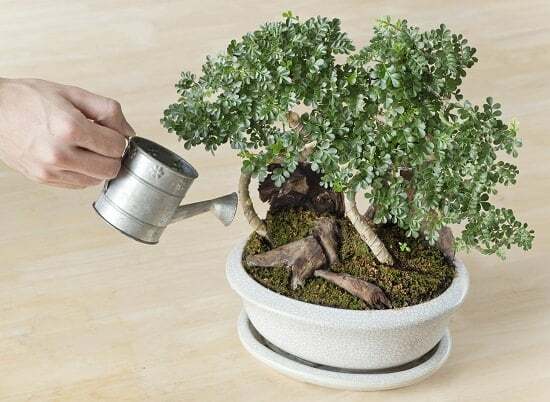 This method involves using a hose or a watering can to supply a regulated dose of water to carefully hydrating the soil without causing damage to the Bonsai. The method involves dunking the entire tree into a bucket full of tap water. Make sure the water reaches one inch up to the trunk. If the root ball starts bubbling as soon as you submerge the tree, that indicates the Bonsai is water-deprived. When the bubbles reach the surface, you know it’s time to stop. Remove the Bonsai and let it drain. 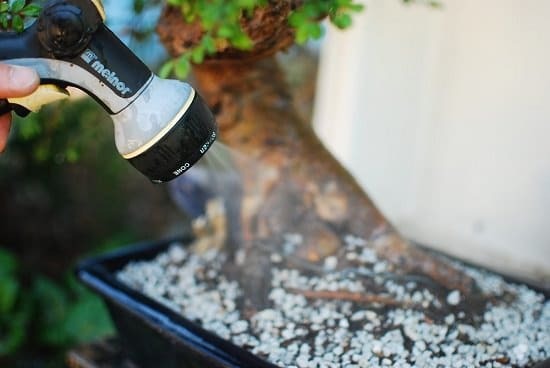 Misting is a quick way to increase humidity for outdoor bonsai. 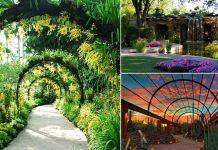 Misting in the evening is recommended in the hot weather, but it should never be seen as a replacement for watering. However, misting indoor bonsai is not the most effective measure to increase humidity. In addition to misting, there are other ways of creating a humid atmosphere for your Bonsai, for example, placing the pot on a shallow tray containing pebbles and water. Check out these tips to learn how to increase humidity indoors. Bonsai trees need regular feeding during the growing season. While normal plants can employ their root system to reach out in the soil and obtain nutrients, bonsai has a space-constrained root system that needs constant replenishment to maintain a healthy nutritional complement. As said before, bonsai trees need feeding during the growth period, i.e., from early spring to late fall or year-round at regular intervals in frost-free climates. Mature trees need to be fertilized less often, depending on the species and overall health, while young indoor trees need regular feeding around the year. Do not fertilize repotted Bonsai during the first month, and infected trees should also be treated first. Fertilize both deciduous and evergreen bonsai trees once in a month with granular fertilizer. If using a liquid fertilizer, feed twice in a month. If required, fertilize your bonsai trees more often in spring and summer–in every 7 to 10 days in weak strength. Instead of a regular fertilizer, use a zero nitrogen fertilizer like 0-10-10 for deciduous trees, when the leaves have fallen in fall. Stop fertilizing in winter during the dormancy period. Keep fertilizing evergreens and tropical and subtropical bonsai trees in the fall and winter. In winter months, keep them indoors to protect from low temperatures and a cold draft. Many cool climate evergreen specimens also initiate their dormant period in harsh winter months from the end of December, January, to mid of February and curtail all the new growth. Observe and stop feeding them during that time. Tropical bonsai trees don’t go into dormancy, protect them in cool weather and fertilize with liquid fertilizer occasionally in winters–Once in a month. If growing in a warm climate, avoid this rule. Never Fertilize a Bonsai that is dry, looks infected, diseased, dehydrated or shriveled up. Additionally, wait till it breaks dormancy and at least a month after repotting before you start feeding it again. Bottom line is that you should never feed a Bonsai that is in stress. Use any nitrogen-rich fertilizer like N-P-K 10:6:6 in spring. Use a balanced fertilizer with NPK 6:6:6 or similar numbers like 10:10:10 or 20:20:20 in summer and a low nitrogen fertilizer with N-P-K 3:6:6 in fall (autumn). When in doubt, using a balanced fertilizer during the growing period while slowly reducing the strength towards the dormant months is advisable. Encourage blooming with a fertilizer that is high in phosphorous, like NPK 6:10:6. With aged trees, use a lower nitrogen content fertilizer. Liquid fertilizers are more penetrable and easier to apply. However, they need more frequent applications to work as they wash away gradually as you water the Bonsai. Granular fertilizers are time-based, they release the nutrients slowly and stay in the soil for a long time. Basically, both types of fertilizers work well and bonsai gardeners prefer using them in balanced proportions. Bonsai are already grappling for life in a space-constrained environment that is the pot. When to left in the same place for years, it starves and dies. Regular repotting is therefore essential. You should know, it’s time to repot when you notice the roots clustered around the root ball or if roots are visible on the surface of the soil. Bonsai trees in shallow pots may also need early repotting. Repotting should be done during the first or second week of spring when your tree is about to suspend its dormancy. Repotting during this time minimizes damage because the tree doesn’t have to carry the extra burden of dense foliage. And the conducive weather of early spring ensures faster growth, promoting healing of damaged roots, if any. The frequency of repotting depends on the species of tree and size of the pot you’re dealing with. 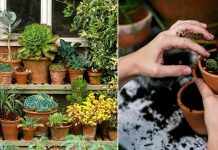 Fast growing species should be repotted every year or two, while mature ones can be repotted every three to five years. The growth speed of every tree depends on many factors, so be sure to check your trees in early spring for signs of repotting.